Make these meatless Portobello 'Burgers' at your next cookout. Full of hearty flavor, everyone will love these delicious Portobello 'Burgers'. Brush tops of mushrooms with half the dressing; grill, top sides down, 2 to 3 min. or until mushrooms begin to soften. Brush with remaining dressing; turn. Grill 2 to 3 min. or until tender. Top with cheese; grill 1 min. or until melted. Mix mayo and mustard until blended; spread onto bottom halves of rolls. Fill rolls with spinach, tomatoes and mushrooms. Prepare using KRAFT Lite Zesty Italian Dressing and KRAFT Light Mayo Reduced Fat Mayonnaise. Prepare using KRAFT Big Slice Pepper Jack or Cheddar Cheese Slices. Heat broiler. Brush mushrooms with half the dressing. Broil 5 to 6 min. or until tender, turning after 3 min. and brushing with remaining dressing. Add 1/4 cup drained thin oil-packed sun-dried tomato strips to sandwiches. 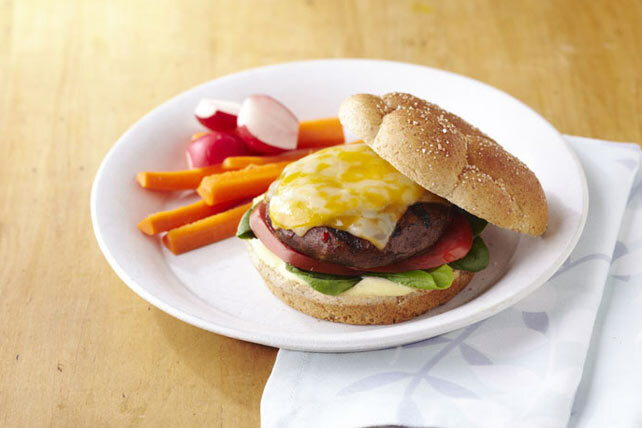 Go meatless with this mushroom burger topped with more veggies! The spinach is high in vitamin A and teams up with the tomatoes to provide vitamin C.